Vice-Premier Liu He will hold a new round of high-level China-US economic and trade consultations with United States Trade Representative Robert Lighthizer and Treasury Secretary Steven Mnuchin in Beijing from Thursday to Friday. Analysts said the two sides are likely to propose weightier measures to address economic and trade differences and to broaden overall cooperation. According to the Ministry of Commerce, based on recent talks in Washington, China and the US will engage in further discussions on issues of common concern. The US delegation arrives in Beijing on Monday. China and the US have been embroiled in trade frictions for several months. The two sides are now in the midst of a 90-day tariff truce, which began on Dec 1, when President Xi Jinping and his US counterpart, Donald Trump, met on the sidelines of the G20 summit in Buenos Aires. Wei Jianguo, vice-chairman of the China Center for International Economic Exchanges, said China-US trade consultations have made "a big stride forward". "In the next stage, the two sides will still be subject to various global pressures. However, I believe that the two sides will be able to propose more weighty measures to solve differences in their further consultations," Wei said. Zhou Mi, a research fellow at the Chinese Academy of International Trade and Economic Cooperation, said companies in the two countries definitely do not want to end their cooperation. Calling for a stable environment, Zhou said more and more achievements may be made through cooperation at different levels. This year marks the 40th anniversary of the establishment of Sino-US diplomatic ties. In 2018, trade volume between China and the US exceeded $630 billion, and two-way investment surpassed $240 billion, according to the Ministry of Commerce. Nicholas Burns, former US undersecretary of state, said the Sino-US relationship is "the most important relationship that both of our countries have." 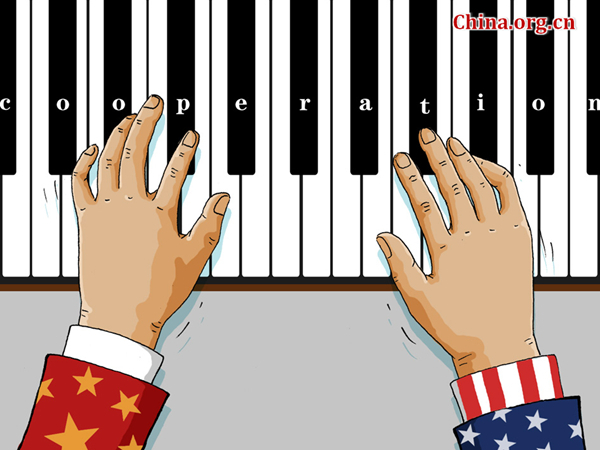 The US and China, though facing certain challenges in bilateral relations, should learn how to compete with each other as well as how to work together, the official Xinhua News Agency cited him as saying. Zhang Yansheng, a senior CCIEE researcher, said the two countries can properly handle trade conflicts and foster cooperation despite some headwinds, adding that cooperation is the best and only choice for the two sides. Xue Rongjiu, deputy director of the Beijing-based China Society for WTO Studies, stressed that the US should not consider China as an economic threat. A country shouldn't be measured by the size of its economy, but by its development level, pointing out that in terms of per capita GDP, China still ranks as a developing country, Xue said. The global community should give China more room for gradual reform including offering more access to foreign companies and supporting investment in industrial upgrading, infrastructure, environmental protection and urbanization, which will further stimulate economic growth, he said.